Great news! I’ve been waiting so long for I’m Your Man: The Life of Leonard Cohen to come out in France, and “le jour de gloire est arrive!” This beautiful updated edition is published by L’Echappee. UK publisher Vintage/Penguin has released a new edition of I’m Your Man: the Life of Leonard Cohen – the first English-language edition of the book that includes a final chapter. Picking up from where the first edition of Sylvie’s book ended in 2012, when it was first published, it covers Leonard’s life and work until his death in November 2016. It’s hard to describe the whirlwind of emotions that came from being in Leonard Cohen’s birthplace on the first anniversary of his death. The city certainly went all-out with its tribute. Even the airport added a sculpted fedora on top of the “O” of Montreal. Down at the old port, a place where Leonard loved to wander as a child, his poems were projected on the walls of the monumental Silo #5. There were other murals on the sides of buildings around the city. Adam Cohen, Leonard’s son, and Hal Willner, who curated the tribute concerts that formed the basis of the film “I’m Your Man”, organised a concert at the Bell Centre with a host of stars to raise money for arts charities. But chief among the homages was the vast and impressive art exhibition commissioned by MAC – the Musee d’Art Contemporain. The exhibition had actually planned to open while Leonard was still alive – the curator John Zeppetelli came to San Francisco to talk about it with me a couple of years back. Leonard, who gave his blessing, would surely have appreciated the highly original art he inspired. Much of it was digital, but at the same time very human, and largely created by younger artists. I joined some of those artists onstage at a panel discussion of Leonard and art at MAC – George Fok, Kara Blake and Clara Furey. They were fascinating. That week I also did two one-hour interviews onstage at MAC. Here’s a link to the one in English with CBC host Eleanor Wachtel. http://tinyurl.com/y7qnaeg7. The other onstage interview was in French with Montreal poet and author Chantal Ringuet – if I find a link I’ll post it later. A number of Leonard Cohen fans came from Europe to participate in the tribute. I was really happy to get to sing a few Cohen songs for them with Montreal musician L’il Andy at the beautifulChapel of Notre-Dame-de-Bon-Secours, whose statue of Mary, “Our Lady of the Harbour”, is referenced in Leonard’s song”Suzanne.” I also sang at the French-language bookshop Librairie Gallimard, just a few steps from Leonard’s old house, where the translators and publishers and I launched the new edition of the first French version of my book, I’m Your Man: La Vie de Leonard Cohen. That same night the first snowfall came, the snow started falling – fat clusters of white like tiny crumpled napkins. It was very hard to say goodbye to Montreal – and Leonard. Leonard Cohen died on Monday 7th November, age 82. His death was announced on Thursday. Sylvie was asked to write a memorial. Still shocked and numb at the news, she wrote this late last night. Since then she has been speaking about Leonard with countless newpapers, radio and TV stations around the world. 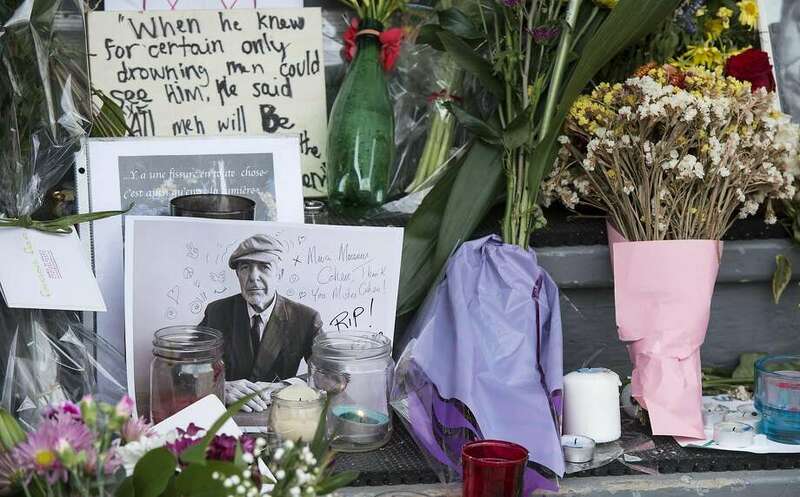 A memorial in front of the home of singer and poet Leonard Cohen on Friday, Nov. 11, in Montreal. I’m shaking as I write this. My brain is numb. In this year of losses, so many losses, in this black week for the world, for me this tops them all. The radio and newspapers keep calling, wanting details of where and how he died. Well, he died at the top of his game. He went out in a blaze of glory. He died with his boots and his suit on. Not onstage — his declining health put paid to those three-hour shows, the rat pack rabbi falling to his knees — but in his home studio, where his son Adam Cohen helped him deliver a masterpiece,“You Want It Darker.” It came out only days before his death. The album title didn’t have a question mark; darker is clearly what we want. And Cohen was always so good at dark, be it black humor, the darkness of the soul or the depths he mined for his poems and songs. This was his third album in five years, which was miraculous, given that in 49 years he had released just 14 studio albums. Cohen was a lifelong perfectionist. He talked about songs having to be torn from him. That old story about Leonard Cohen and Bob Dylan trading lyrics in a Paris cafe is true. Dylan showed Cohen a new song and Cohen asked him how long it took to write it. “Fifteen minutes,” answered Dylan, and asked him how long it took to write “Hallelujah.” Cohen replied, “A couple of years” — too embarrassed to tell him it was five. “You Want It Darker” is one of the richest, deepest, most beautiful albums in a lifetime of rich, deep and beautiful work. He was a serious artist. A deep man, very deep. Cohen was born in Montreal to a family of stature — his forefathers were rabbis and founders of synagogues and newspapers — and never denied that he was from the right side of the track. He grew up pre-rock; the tradition behind him was poetry. Raised on the English poets, at age 15 he discovered the work of Federico Garcia Lorca. That was the same year that he started to play guitar. He said that there was music behind every word he wrote. He was a published poet, a golden boy of Canadian poetry before he tried his hand at writing songs. He never stopped writing poetry. He also published two novels. As a visual artist, he painted a series of droll self-portraits. Cohen sang himself back home in his last album. The cantor and the choir of Congregation Shaar Hashomayim, the synagogue that his great-grandfather founded, accompanied him as he sang “Hineni,” I am ready. Yes, he’d been saying that for years, if not in Hebrew. Although he could laugh about himself and often did, he was serious about life and death, about family, about being a Jew. His lifelong spiritual explorations were also serious; they were never an accessory for him. So many stories of the lives of musicians and poets have an unhappy ending. But not Leonard Cohen. He had his career upside down, more popular at the end than in the beginning, when there were critics saying they should give away razor blades with his LPs. For decades Cohen suffered clinical depression. He knew darkness and looked right into its eyes and managed to raise a smile. And an extraordinary body of work. “This world is full of conflicts and things that cannot be reconciled, but there are moments,” he said, “when we can embrace the whole mess.” I was just thinking of that quote after the election on Tuesday, Nov. 8 — not knowing that Cohen hadn’t lived to see the result. I’m going to miss that man. Everything. The whole mess. I’m so very grateful to have known him, to have had his support and friendship. And so grateful to have his words and music. He is irreplaceable. Sylvie Simmons is Leonard Cohen’s biographer. “ I’m Your Man: The Life of Leonard Cohen ”(Ecco) was published in 2012. She is a San Francisco-based music journalist and singer-songwriter. Sylvie’s five-star review of Cohen’s You Want It Darker album is in the new issue of MOJO magazine, dated November 2016. The Brazilan press has hailed the new Portuguese edition of I’m Your Man: The Life of Leonard Cohen with rave reviews. The Brazilian edition is published by Editora BestSeller in Brazil and contains a 16 page glossy insert of photographs, many in color. Sylvie, meanwhile, has been in Los Angeles performing with the celebrated, all-male, a capella Leonard Cohen tribute Conspiracy of Beards, opening their shows with a full set of her own and Cohen’s songs, and joining the 24-piece choir as their guest singer on Leonard Cohen’s song ‘The Window’. Her last show with the group will be on Sunday May 8th at the beautiful Throckmorton Theatre in Mill Valley, California. See ‘Tour’ for more details. Watch out for interviews with Sylvie in O Globo and other Brazilian newspapers and magazines in the days to come!